Did you know you could knit a poem? In October 2009, a giant handknit Dylan Thomas poem was unveiled in celebration of National Poetry Day Live in London. The project was coordinated by The Poetry Society and involved more than 1,000 knitters and crocheters worldwide who each knit individual letters of the words of the poem in 12-inch squares. The Poetry Society's website has a fun Knit a Poem game where you type in a poem and they "knit" it for you. 1. You can use any pattern. 2. You can use any yarn you wish. 3. You must have fun. 4. Anyone can join at anytime- there are no deadlines. 5. There are no more rules. 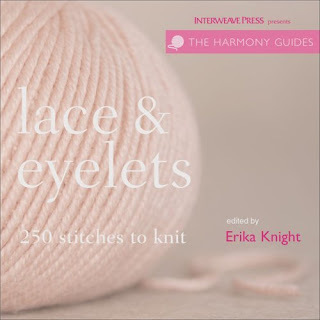 Speaking of lace, this morning I woke up super early and couldn't get back to sleep, so I trudged over to the bookcase to find a knitting book to browse. Low and behold, Lace & Eyelets jumped out at me. I forgot I had this book! I bought it a few months ago at a used bookstore and never got around to reading it. It felt like some sort of kind-hearted knitting fairy had left me a gift. Yesterday while surfing around the Internet I learned about Knitzvah and I'm so inspired. Over the course of a year, volunteers at the Jewish Community Center in my area knit 2,000 items for distribution to children's shelters, hospitals, and refugees. It turns out there are Knitzvah groups all over the country doing this. The word "knitzvah" is a play on "mitzvah." In the Jewish tradition, a mitzvah is a commandment from God and also a general term for a kind deed. In not-so-knitty news, I think my home is haunted. Last night when I went to sleep, everything was in order. When I woke up, a painting in the living room was mysteriously askew. Other weird things have been happening, too. A roll of toilet paper self-destructed while I was at work. Small kitchen items have been disappearing, only to reappear in the cat bed. It couldn't be the hijinks of this guy. He's an angel. I would join that knitting thingy but they would put my picture in the post office:) Great idea about knitting for the babies. You are so sweet to be thinking of doing all that hard work for someone else. That's who you are, I know that about you! Now as for you blaming that little kitty for doing bad things. That just isn't nice:) It must be a ghost! Have a blessed evening way out there! Hugs from me! Ohhhh Charlie - I think she's on to you! Lots of great knitty news. That lace book is so pretty. I believe a fairy must have left it for you! I love your knitting charity idea. Maybe you could get something like that going in your area. I enjoyed the knitty and kitty news. Great ideas to work your knitting into a charity of some sort. I do see how you'd have to give quite a bit of time over to that. Nice ideas, though. Ooh, the lace book looks inspiring! I haven't figured out what I'm doing yet. Lace scares me a bit! You sound inspired and I think all your knit for charity ideas are wonderful. Keep those precious thought and take action. Oh that Charlie. I think he has been having fun in your absence or sleep. Cats are so funny. Happy happy silly Sunday to you. Thank you for your kind posts. I've been conflicted on posting on my spiritual side but it's comment's like yours that keep me going. I'm going to be joining Kate's Lace KAL. I'm excited. I'm thinking of making some lacy socks. I'm Really Bad at lace, so I'm excited to try to improve my skills. Then again, a gorgeous smoke ring would be good . . . so many choices! Thanks for mentioning the KAL! I hope we get a bunch of people- it's gonna be a blast. Hahaha -- methinks your little angel might be a little devil when you're not looking. He sure is cute -- whichever role he's playing! Hi Stacy, I knit a couple of letters for the Poetry Society. It was a fun project to be a part of and such a great idea. I loved the concept. Your book find looks nice, it is always a treat to come across a book you've forgotten about and have a good read. he he your cat looks so sweet! mine is the same, you can just see her head peeking in on my blog header photo! Your have some GREAT ideas and I think you should DO IT!!! I'm mailing my ATC tomorrow :) It was harder than I thought it would be! It must be a ghost! There is no way that adorable Charlie could ever do anything wrong. Ok...don't believe that angelic cute look for a minute...I have one of those and I can tell you, they are little devils when no one's looking. But sweet and purry,too. So I always forgive her.